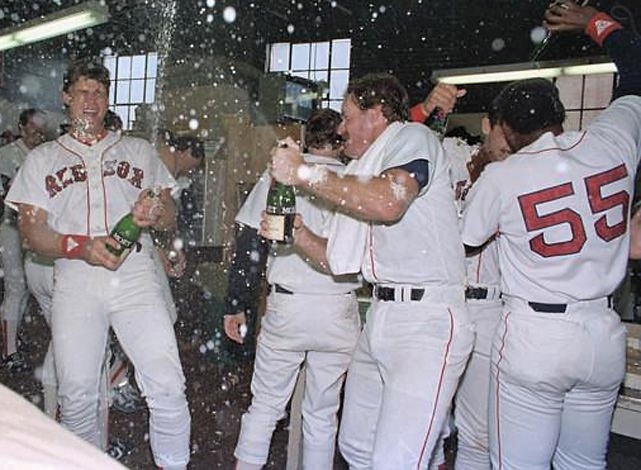 ON THIS DATE (September 28, 1986) ... After an 11-year wait, the Red Sox completed the final chapter of this American League East drama with a 12-3 victory over the Toronto Blue Jays, with a crowd of 32,929 roaring its approval. After the victory, which wrapped up Boston's first AL East crown since 1975, the Sox found themselves on the field for a series of curtain calls that could have lasted for hours. The fans had to show their appreciation to a team that was given little chance in the spring but yesterday won the division title with its 93rd victory. They wanted to cheer Oil Can Boyd, whom fate put in a starring role, and who came through with flying colors. The fans never gave up on him, and today they joined his teammates in sharing with him the greatest moment in over a decade of Boston baseball. Boston's September surge (17-7) had convinced the fans that it could cast aside the ghosts of past failures. For the Can to come through in the clincher was the topper of a fabulous day and a fabulous regular season. Meeting the challenge is what McNamara has preached all year. There were a few nervous moments, and no one could have predicted the rout, or the stylish manner in which the fans accepted a victory that many felt as recently as a month ago would never come. Boyd made McNamara nervous in the sixth inning and prompted a visit when Boston was leading, 10-3. But it was only to remind him that the Blue Jays weren't about to roll over and play dead, and no lead in Fenway Park is safe. Boyd gave up an infield hit that loaded the bases, but then retired the last 11 batters to record his 16th victory, a career high. It seemed a symbol of all that could have gone wrong for the Red Sox in 1986, and didn't. The outcome of the AL East race had been a foregone conclusion for a week. Today's game was full of emotion, even though it was all but over when Boston routed rookie Duane Ward and scored five times in the second inning. The Red Sox got the job done in the same manner in which they ran off 11 victories earlier in the month, putting the Blue Jays and the rest of the pack far behind them. They pounded seven pitchers for 13 hits yesterday, including a single by Wade Boggs that kept him atop the batting heap at .352 and was his 200th hit of the season. Winning was a special moment for the newer Red Sox and for the ones who had almost forgotten what it was like. Wade Boggs collected his 200th hit for the fourth straight year, a first for a Boston player. He also picked up two more walks, giving him a season total of 103 and making him the first player since Stan Musial in 1953 to have 200 hits and 100 bases on balls. Meanwhile, after the game, the loyal legions were calling for the Can. Owner Haywood Sullivan was rounding players up for curtain calls, and the Can was the last to return to the Fenway lawn. He emerged from the dugout at 4:40 and blew a kiss toward his wife, who was waving from the upper level. He waved and pranced for a few more moments. The he ducked back into the tunnel and was gone.